LOVE this talk by Anthony (黃耀明 Wong Yiu Ming)! 20:22 The world of 武林 is a bit cartoonish as killing has no consequences not unlike the world of Tom and Jerry. 1:20:23 區家麟’s question re “查良鏞曾經講過, 報紙是老闆的私器” How did Ming Pao reporters react internally? 1:22:20 to 1:26:06 新華社社長許家屯聲稱有人”不按本子辦事”. Cha wrote an editorial of which Margaret refuted point-by-point with her own 3000 – 4000 words articles. 1:58:30 周保松 asks Margaret to share more as she read his fictions so many times and worked with him so closely. P.S. Margaret, Thanks for sharing your insight. 保松, Thanks you and Brew Note for hosting. Ed, Thanks for processing and posting the video so quickly! The processing of the 143 minutes must have taken many hours even on a fast machine and the uploading must have taken many hours as well! P.S. Here you see the English and Chinese promotional posters being placed side by side. I love the placement of the English text “between the myth and the man” in a vertical form underneath the divider of “Jin Yong” and “Louis Cha”, I wish similar symmetry can be echoed in the Chinese version. I like the use of a separate colour of some of the text in the Chinese poster (although I haven’t decided on which of the text) and would love to see the Chinese version also use an additional colour. Overall, two lovely posters and very nice Chinese translated title all done by volunteers in very short time! I can’t wait to watch the recorded video when it is available! Many thanks to Margaret, 保松, and his wonderful team of awesome volunteers! I hope I will have the luck to attend Brew Note 文化沙龍 one of these days when I visit HK! 2018 Nov 11th update: //I’m still part way through watching the following HKTDC 2006 video of 金庸先生 answering some very good questions. In some answers, we can see “Jin Young the myth” (borrowing Margaret’s words) explaining/excusing his own new revisions. In memory of 林燕妮 (Eunice Lam). News “林燕妮因肺癌病逝享年75歲” & news (with video). Following are some random old articles by Eunice. Great articles. Wonderful taste. Interesting & insightful person. RIP. 話說幾個月前, better half同我比自己踢咗入會做卡城動物園嘅會員, 一個超值年費價錢(包泊車), 可以睇企鵝, 睇蝴蝶, 睇紅熊貓, …, 同埋等睇2018來嘅真熊貓, 其實係一個好好嘅發現. 仲可以順便”免費”做gym(行行企企3,4,5個鐘頭, 其實都幾係嘢, 同做gym差唔多)! 啱啱呢個星期六行完動物gym之後, 就收到好消息話 Michelle 又張「兩周一聚」復活啦! 版名重”江湖味濃郁”到叫【五湖四海】,又”非死不可版”! 好嘢, 好玩! 其實我都唔知道咩嘢叫做「地道菜」? 不過當時我同better half (同其他十幾廿個卡城嘅foodies) 坐坐企企係冰天雪地嘅街邊, 預咗等一個鐘頭去食日本拉麵, 咁我諗呢一 碗日本拉麵都當係「地道菜」啦! 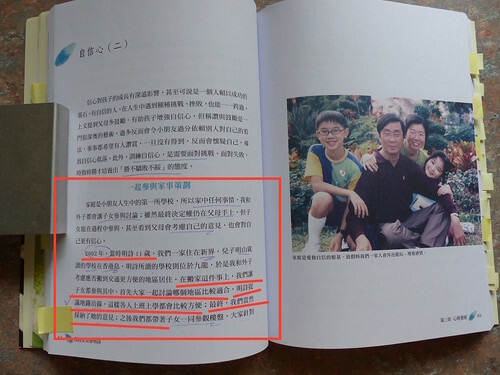 啱啱睇完麥何小娟 (Silvia)嘅新書《我的女兒麥明詩—一張白紙到10優的培育經歷》. 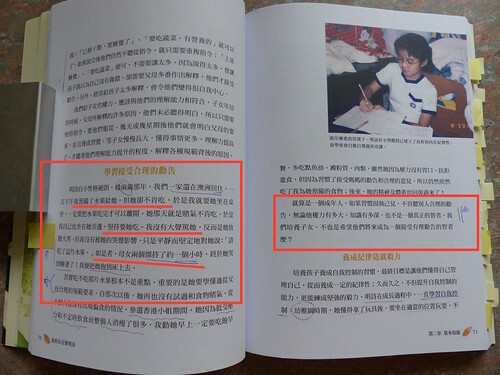 同大家分享我對呢本書嘅一啲睇法, 寫一個簡短嘅所謂”書評”. 我少寫書評, 通常係我鍾意嘅書我先寫. 幾年前係大贊Alice 寫嘅「股神」畢菲特傳記 The Snowball, 本書有960頁, 所以我可以用個特別方式, 寫咗一個非常詳盡嘅”書評”. 之後有緣, 知道咗Alice嘅一啲行為同埋說話,非常佩服, 仲同佢做咗”Facebook朋友”. 好啦, 言歸正傳, 首先作者Silvia唔係一個普通媽咪. 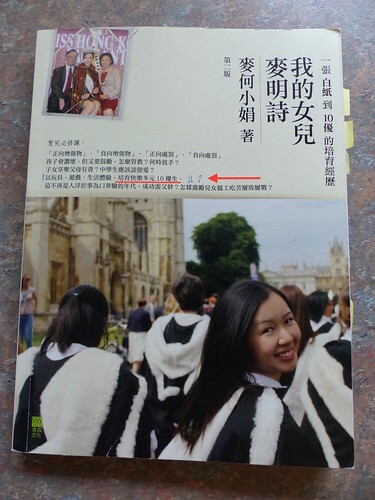 有啲人買《我的女兒》, 係因為Silvia係10優港姐麥明詩嘅媽咪, 諗住睇完本書之後, 可以教番個囝囝囡囡攞到10優. 其實呢個諗法, 作者都會話你錯. 作者嘅丈夫麥卓生講得好, Silvia直情係一個「專業良母」, 點解咁講? 睇書嘅”作者簡介”, 就會睇到Silvia其實响香港/澳洲/美國, 都有專業嘅資格, 唔係普通媽打一名. 筆者順帶一提, 香港有一個好奇怪的現象/風氣, 就係學生/學校, 甚至社會新聞媒體, 都將中學嘅公開試成績睇得太重. 會考(以前)/DSE(現在)成績有幾多A, 有冇9優或者10優? 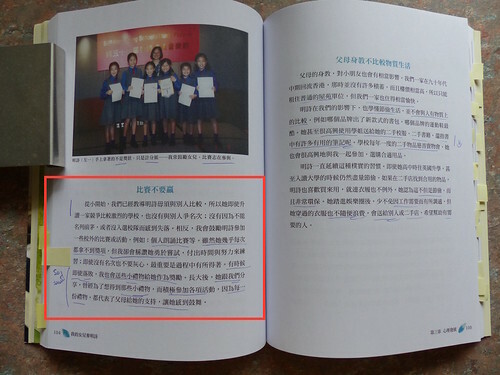 中學係邊間名校讀書? 甚至有聽過大學畢咗業嘅成年人, 身痕走返去考中學公開試, 睇下攞到幾多個A. 呢啲所謂”成年人”真係發神經! 種種睇公開試睇得太重嘅行為, 都可能係令到中學生有過分壓力嘅原因. 响美/加/外國, 成功的商人或者科學家(諾貝爾獎得主),等等, 成名之後都可能留意吓佢地係邊間大學畢業. 係大學! 我從來都冇聽過佢地係邊間”名校中學”畢業, 中學公開試攞咗幾多個A?! 作者好有系統咁樣, 將唔同題目分成唔同章節, 因為有好多唔同有趣嘅例子同相片, 一啲都唔會覺得好似一本百科全書咁悶. 寫到有充實的資料, 理論嘅根據, 睇來有趣而又有內涵, 呢個其實幾難得. 作者就做得到啦. 我睇書嘅時候鍾意用筆畫低我覺得重要或者有趣嘅地方. 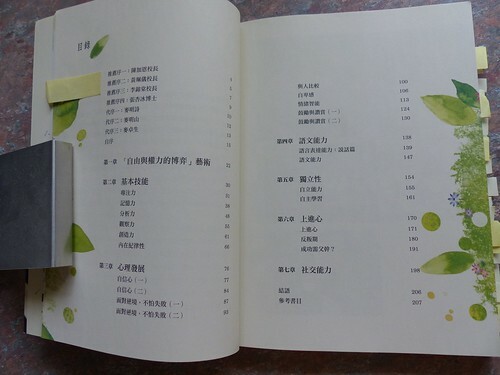 寫呢一個書評嘅時候, 我就重溫我畫低的筆記, 因為本書始終係~200頁的書, 我只可以抽其中三個有趣嘅故事, 同大家分享. 第一個故事, 係作者同麥明詩母女倆個人, 為咗一見水果僵持左大約一個鐘頭. 個一片水果完全唔重要, 作者處理嘅語氣, 堅持既原因, 之後嘅處理, 呢啲先至係家長應該可以學習的地方. 第二個故事, 係一個地鐵嘅故事. 一個11歲嘅小朋友, 點樣可以幫到屋企人, 將一個非常重要嘅決定, 做得更加好呢? 第三個故事係講作者鼓勵明詩勇於嘗試, 參加唔同嘅比賽, 幾乎每次都贏不到獎項. 有時落敗, 作者都送一些小禮物俾明詩為獎勵. 呢啲小禮物, 又代表咩呢? 1) 我明白作者要同出版商合作, 每一章節嘅標題, 都可能有編輯提供意見, 所以未必一定係作者自己的決定. 可能我有啲吹毛求疵, 我覺得”父母鼓勵 反敗為勝”呢個標題, 同本書嘅宗旨有啲背道而馳. 既然成敗輸贏都唔係太重要嘅話, 最緊要係個學習過程, 咁又何來反敗為勝呢? 當然,呢個我亦都覺得自己可能有啲太過過分”吹毛求疵”. 2) 我鍾意作者好有心機咁樣放咗一個參考書目. 有39本中英文參考書. 等有興趣嘅讀者, 可以伸延閱讀. 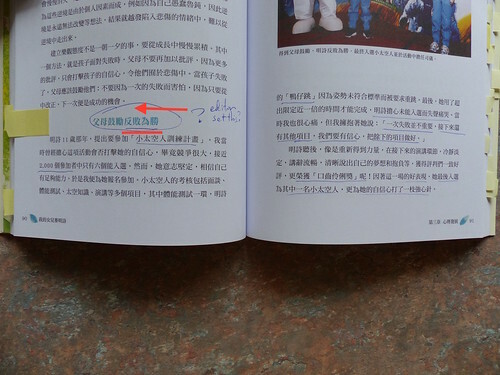 我自己都已經有用咗Google Book Search係搵咗一本書, 睇咗開頭幾頁書. 如果有機會, 其實可以將呢39本參考書, 分類於不同章回, 以方便讀者讀完不同章回嘅時候, 方便佢地伸延閱讀有興趣嘅特定題目. 同埋兩張相, 一張BB相, 一張長大成人亭亭玉立嘅靚女相. 意重深(心)長. Before & After. Then & Now. 其實呢一段”結語”, 可以或者甚至應該係第一章第一節嘅說話, 等睇書嘅家長明白栽培方法唔會係千篇一律, 睇書可以睇得輕鬆啲. 《我的女兒麥明詩—一張白紙到10優的培育經歷》係一本有好多好例子嘅工具書 (微型育兒百科全書). 用家 (即係啲香港家長) 唔應該太緊張, 緊張到想將百科全書裏面每一個題目(每一招一式), 都想要用晒响自己嘅仔女身上. 其實只要用到三, 五, 八 … 招都有唔同程度嘅幫助, 始終要配合自己仔女嘅特質. 附筆: 呢次算係我第一次用電腦口講中文(廣東話)寫文章. 以前要用手寫嘅長文章, 要我花上幾個鐘頭, 太花時間. 而家我發現到電腦嘅新操作系統(Mac OS)可以俾我口講, 佢就幫我轉成中文字, 最多執下一啲別字. 咁就容易得多啦. 但係始終有時都會有啲錯字, 好似個”下”字, 應該有個口, 隔離先係個”下”字, 即係”吓”字. 呢啲無辦法啦, 敬請各位見諒. Oct 21, 2016 Facebook comment update: P.S. By the way Silvia, I didn’t have the time to write this in Chinese. Plus I don’t know how to get the “tone” right. Since I am writing it now in English, I may as well just copy and paste this into the Chinese book review. I should have thanked you (and Louisa and 明山). So I am thanking you now for sharing the very personal and intimate stories and history of Louisa’s and 明山’s upbringing. I am a long time fan and addict of longitudinal studies for they give me insight that only “time” (the most precious commodity) can provide. I was fortunate to get myself hooked in the “Up Series” (7 Up, 14 Up, etc) at the UofT AV library and I last watched 56 Up in 2012. Silvia, as usual, I write too long and too much. I hope you will be pleased to hear one of your readers kept thinking of Jean Piaget as he read your book. This stranger will be watching 明山/明詩 grow old as I watch the participants of the Up Series (63 Up in 2019) grow old over time and wishing/hoping them to do well in life. P.P.S. This “longitudinal study” (obviously not a scientific study in this film) started when these boys & girls were 7. Here they were all adorable as any seven years old would be in this first video “Seven Up (1964)“. We last saw them when they were 56 in 2012. Worth finding the whole series to watch. Calgary library system has it, I wonder if HK library will have it or YouTube, etc. When watching the films, I try to observe and learn as much as I can but also holding off any judgements or conclusions as it seems so unfair for me to “judge”. My wife and I want to say a special thank you to Mr. Andrew W.F. 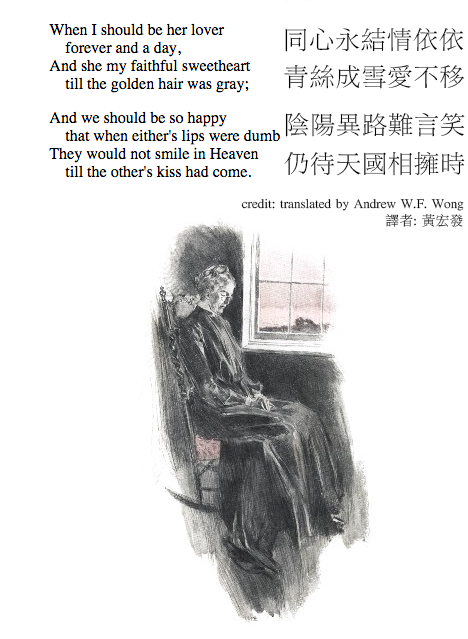 Wong 黃宏發 (Andrew was the last President of the Legislative Council of Hong Kong during British rule) for taking time to translate the special stanza from “An Old Sweetheart of Mine” I used in my marriage proposal and wedding announcement (of which I only shared the first line). P.S. I wish I had the opportunity to meet Andrew in person but I haven’t had the pleasure yet. Andrew’s fair minded and excellent work during his time as President of the Legislative Council of HK remind HKers the fond memories we miss these days in HK. My wife and I were really happily surprised to see Andrew taking time to translate the beautiful stanza for our wedding which we take as a special gift. In recent years, it has been my pleasure to read Andrew’s poetry translation work at his fascinating blog “Classical Chinese Poems in English” once in a while to revisit some classic Chinese poems along with Andrew’s graceful English translations to relax my mind. Which is why I reached out to Andrew to ask him a translation question about“An Old Sweetheart of Mine”. Thanks again Andrew for your beautiful translation to help celebrate our wedding! And yes Andrew, it is indeed been my (now “our”) ambitious plan to work hard on our marriage, love each other dearly, stay healthy for each other, etc etc so that I can present this stanza to my wife on our 50th Wedding Anniversary in 50 years time. till the other’s kiss had come. of that old sweetheart of mine. Note: Sorry, I wish 林語堂 had done a Chinese translation but I couldn’t find one and this is way beyond my skills or the time I have. Jan 20th, 2015 Update: Here is “An Old Sweetheart of Mine” as read by the poet James Whitcomb Riley himself! Many thanks to my online friend/poetry translation (Chinese to English) expert Andrew Wang-Fat Wong 黃宏發 for sharing this with me!